If you’ve been injured in an auto accident and aggravated an existing injury, you can still make a claim for the injuries you sustained in the accident. In order to do so, we will need to show the amount or percentage of injury that is attributed to the accident and the amount that was already there, which is called a preexisting condition. The law requires the at-fault party is responsible for the injuries they caused due to their carelessness. With that in mind, they are not required to cover harms and losses that were there before the careless act. Watch the video to learn more. If you have additional questions regarding a claim for injuries you sustained in an auto accident, I want you to call me at (559) 436-0850. I welcome your call. 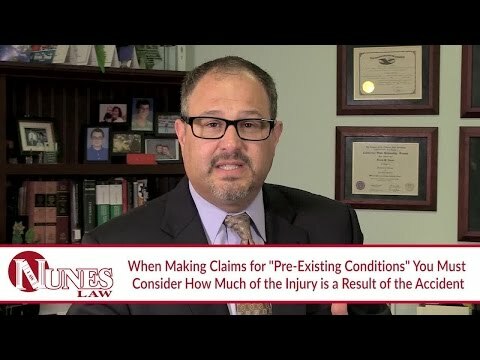 Visit our educational website at www.NunesLaw.com for more videos and media content from our law firm.